You might think cuttlebones are just for good beak grooming, but they are also for good bird health! This natural material provides important calcium and minerals to supplement your bird's daily diet. Zoo Med's Banquet Cuttlebone Mineral Blocks are made with real Cuttlebone powder, making them an ideal mineral source for all pet birds. These blocks help condition birds' beaks and serve as an excellent source of enrichment as they perform natural chewing behaviors. Banana Flavor. Penn Plax Bird Cuttlebone with mango and banana flavors are enriched with Oyster Shells, Omega 3, Honey and Vitamin B1. They provide the necessary calcium and minerals to compliment a balanced, nutritional diet. The bright colors are designed to encourage the natural pecking instinct while trimming and conditioning the bird's beak. Calcium is needed for strong bones, proper muscle function, and egg development. Birds will use our Calcium Cuttlebone to trim and sharpen their beaks! It also provides hours of exercise, relieves cage boredom, and stimulates the natural foraging instinct. Birds of all sizes will naturally crave it! 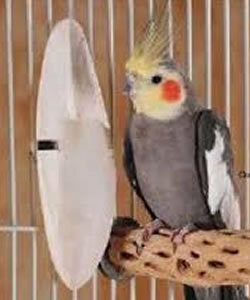 Add some versatility to your bird's snack routine with the Prevue Pet Products Birdie Basics Cuttlebone Holder. This bright yellow holder hangs easily in any cage, and can hold a variety of treats to help keep your bird healthy and interested. Cuttlebone is an all-natural calcium and phosphorous supplement, important for healthy bone structure. Supplies calcium and other necessary minerals and helps keep beaks sharpened and trimmed. Includes metal holder. Suitable for all birds. Cuttlebone is an all-natural calcium and phosphorous supplement, important for healthy bone structure. Supplies calcium and other necessary minerals and helps keep beaks sharpened and trimmed. Includes metal holder. Suitable for all birds. 2 Pack. A unique and perfect combination of a tasty mineral block and a natural cuttlebone, which are essential to your birds health. They provide the necessary calcium and minerals to compliment a balanced, nutritional diet. 2 in 1 Cuttlebone / Mineral blocks are a unique and perfect combination of products which are essential to your bird's health. They provide the necessary calcium and minerals to complement a balanced diet. The bright colors are designed to encourage the natural pecking instinct while trimming and conditioning the bird's beak. Pack of two (1 Banana, 1 Berry) Each measures approximately 5 x 2.25 inches wide.